Artist Sarah Coleman arrived at full-time career in illustration and typography via the bizarre and magical worlds of pirate radio, lecturing, youth work, theatre and typesetting obituaries. Creating words and pictures for an international client base, Sarah has had 12 solo exhibitions across the UK and US. Her second and third fingers of her right hand are permanently stained with black ink and can only be removed with bleach…for special occasions. 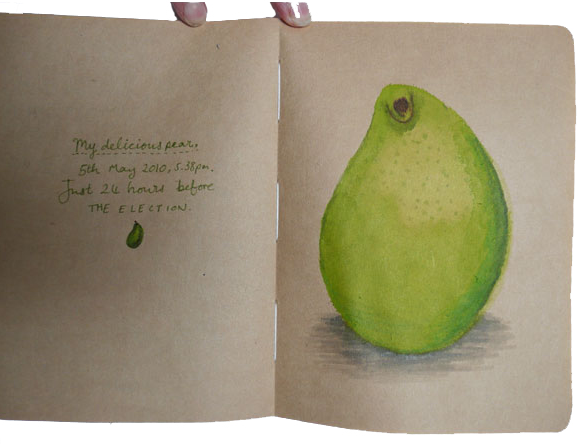 When asked to submit her favorite image(s), she sent “My Pear”. To see more of Sarah’s work go to her website and Altpick page. This entry was posted in Illustrations, Italy and tagged pear, Sarah Coleman, sketchbook, typography, UK. Bookmark the permalink.